Remember my visit to the NTU Heritage Centre which I wrote about previously? While on my way back from the place, I spotted this very unique find, an abandoned SBS Transit bus. Covered with moss, dust, small trees and torn sticker livery, it's definitely something that you don't get to see everyday. As I was curious, I dug up some information about the bus and here's what I found. 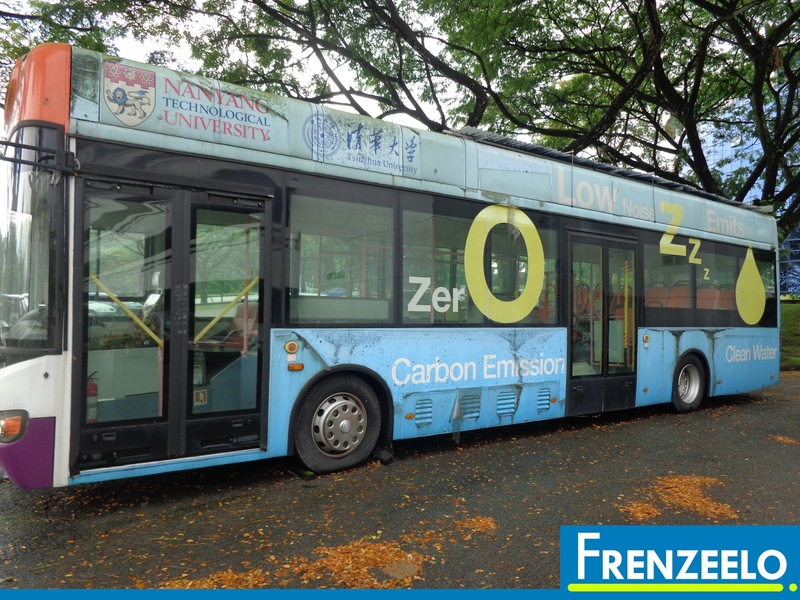 First of all, the abandoned bus was the result of a collaboration project between China's Tsinghua University and Singapore's National Technological University (NTU) where they created technology to make buses more fuel efficient and environmentally-friendly (called Fuel Cell Technology). 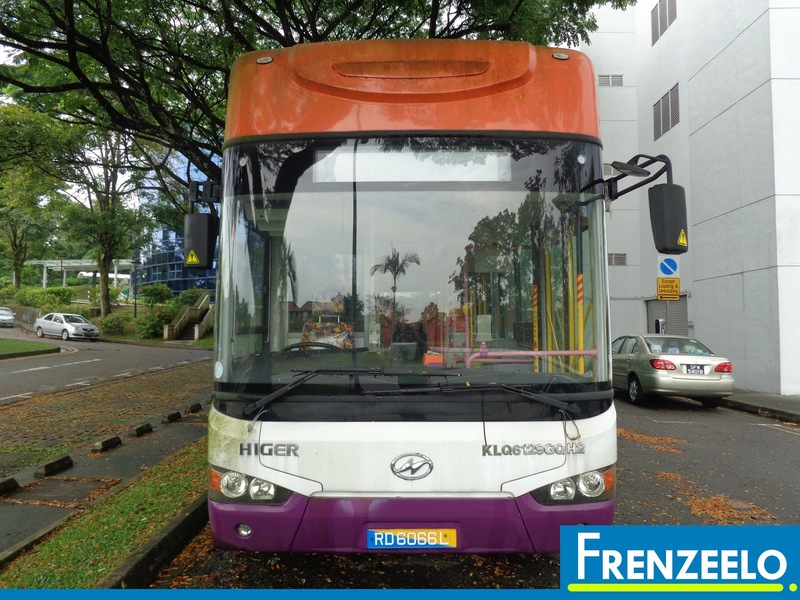 The two universities partnered up with Higer, a Chinese bus manufacturer to create a bus that would be using the green technology they created and SBS Transit, Singapore's largest bus operator to operate the bus in Singapore. 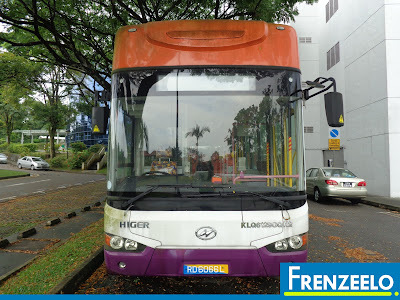 The official name of the bus is the SBS Transit Higer Fuel Cell Bus and it arrived in Singapore shores in 2010. Was the bus used as a public bus? 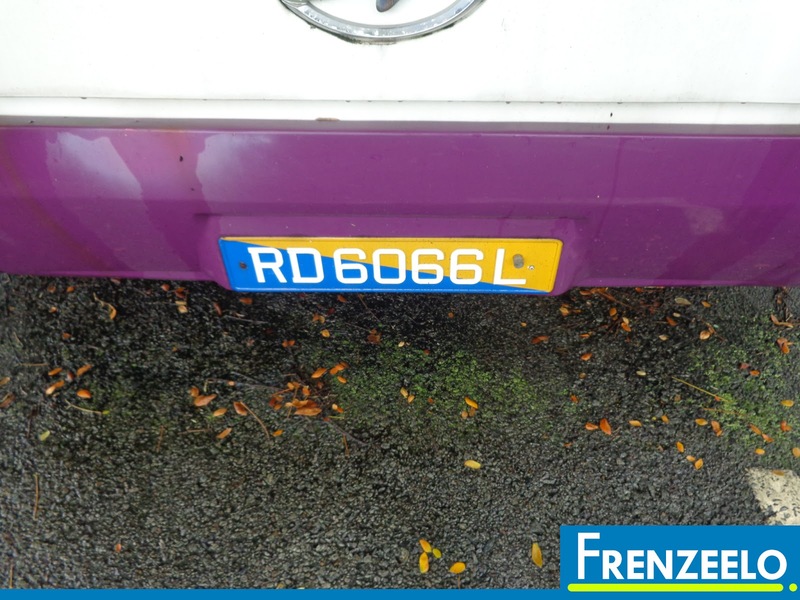 Although the bus looks similar to the existing public buses in Singapore with the signature SBS Transit orange and purple livery (surprisingly, the SBS Transit logo wasn't present), it has never entered revenue service. Instead, it was temporarily used as a shuttle bus to transport athletes during the 2010 Youth Olympic Games from NTU (where the Games Village was located) to their training centres. 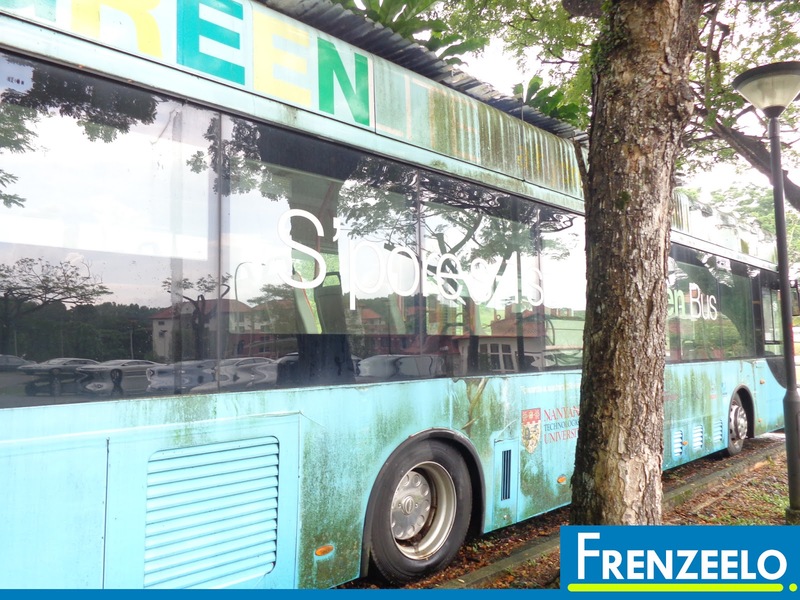 Were there any other "green" buses used by SBS Transit? 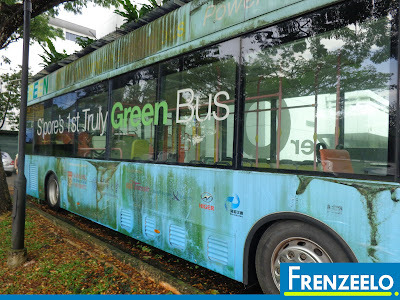 The Higer Fuel Cell Bus, was not the only "green" bus used by SBS Transit. 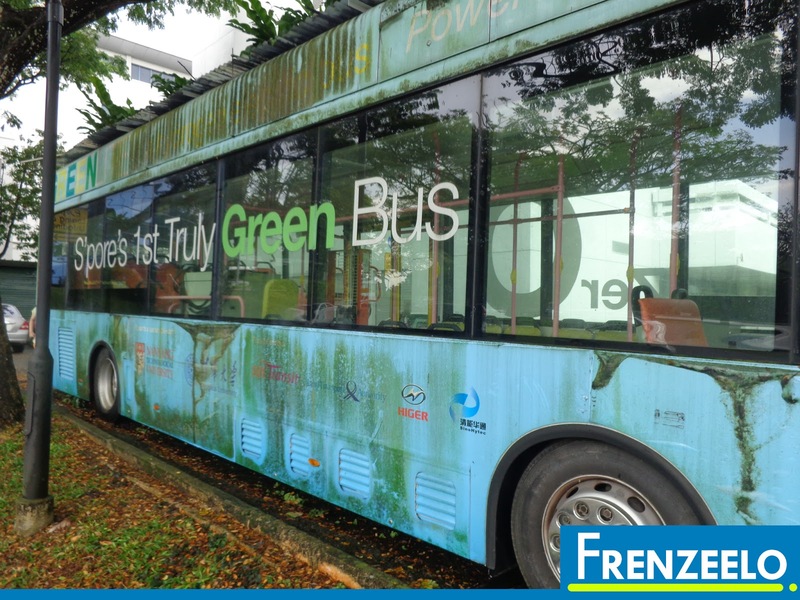 In fact, there were two other "green" buses that were trialled by SBS Transit using hybrid technology. Also created by a Chinese manufacturer, Sunlong, the two buses were unfortunately shortlived and sold off to private companies due to the buses' maintenance unreliability. 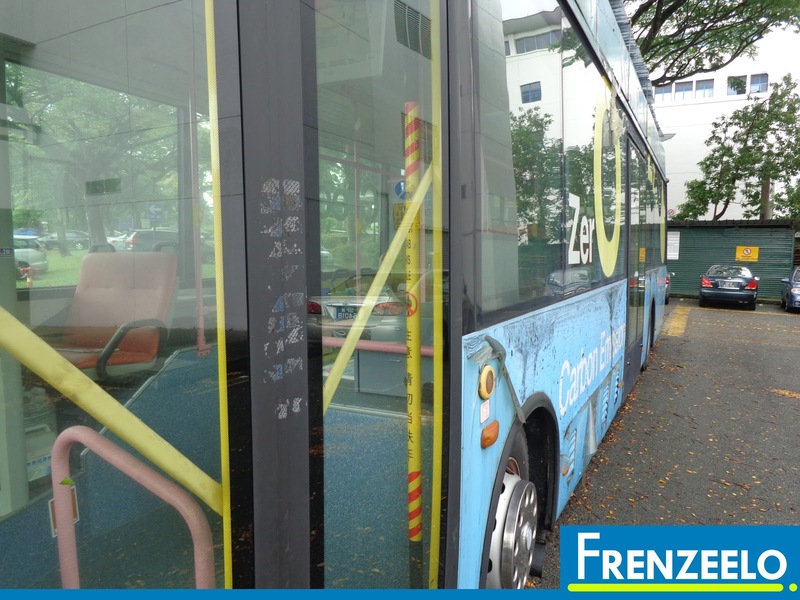 There were also a few models that SBS Transit currently uses that can be considered "green" which are the Volvo single deck buses powered by Compressed Natural Gas or CNG for short. 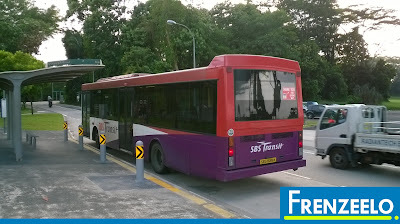 However, SBS Transit bought a minimal amount of such buses as they had to be refueled in Jurong (where the only CNG kiosk is located) so they are only limited to bus services operating from Jurong East and Boon Lay. NOTE: The bus pictured above is the non-CNG version. The bus has a slightly unusual design. First of all, the bus has a high rooftop mainly because majority of the bus' technology were located on the roof of the bus. Second, the Electronic Display Signage or EDS for short is surprisingly small which is in contrast to the usual EDS that you find on typical SBS buses. Third, there were TV screens in the bus reminding us of the time where public buses used to have TV screens on board until its demise in 2009. 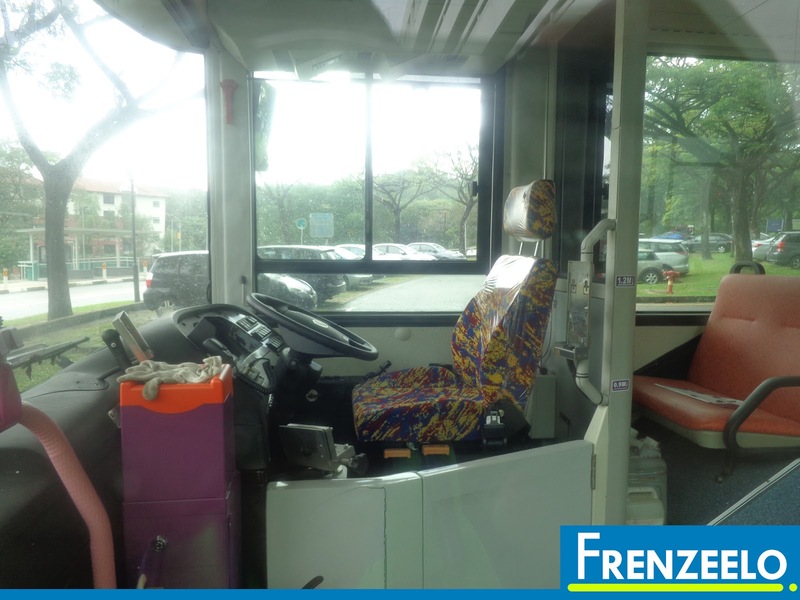 Other than the two unusual designs found on the bus, the interior looks pretty similar to a typical SBS Transit bus with its bright orange and yellow seats (they're the same type of seats), the grabpoles are purple and has the orange and purple coinbox for revenue collection purposes (although the thermal ticket printer was absent). It seems that the bus is wheelchair accessible as well. 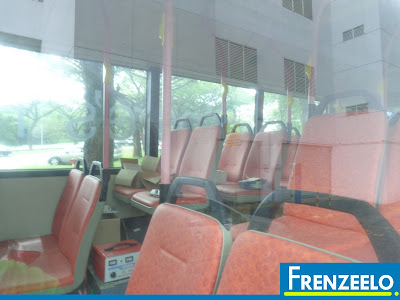 The bus looks like its suitable for regular revenue service though its unfortunate that SBS Transit didn't give it a chance to go on revenue service. 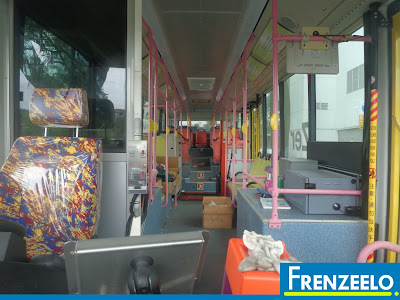 The bus was also used as a storage area with gloves stuffed into the coinbox and some trolley contraption thing occupying the wheelchair bay. The bus looks very dusty on the inside as well. On the outside, thick algae can be seen accumulating, the sticker livery was peeling off, the windows were very dusty and big overgrown plants can be found on the roof near the aircon pods. A block of wood was also placed in front of the front wheel of the bus probably to prevent it from moving. All these suggests that the bus has been abandoned for quite a long time. Perhaps since 2011 or even more. It's sad to see the bus abandoned when it can actually be put to good use. After a short stint as a shuttle service for Youth Olympic Games athletes, the bus has not been in use since. There were plans to convert it to an electric vehicle but apparently it seems that the plan has been abandoned as well. When I visited the bus, it was in January 2015 although there were photos and reports that surfaced online in February 2015 that the bus was being towed away. The state of the bus is now unknown although there is a very high chance that the bus has been disposed off and scrapped after being left alone for a very long time. 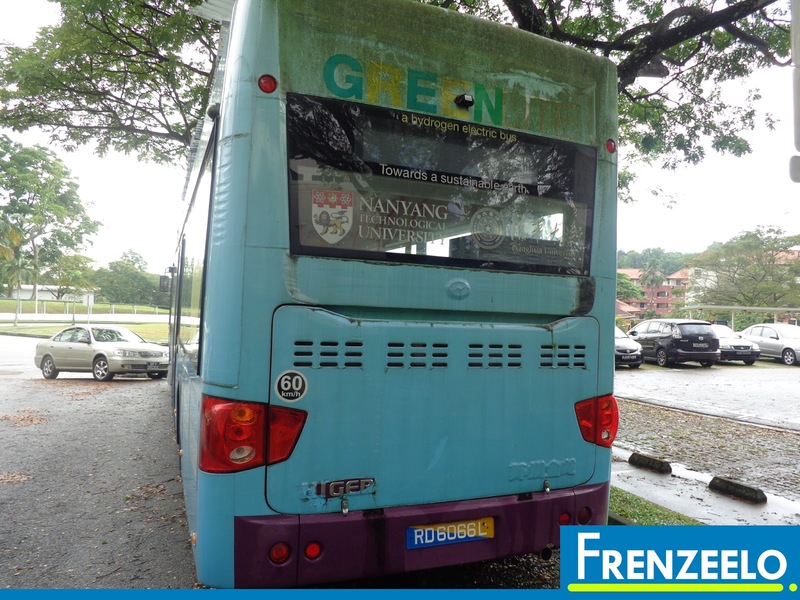 It seems unfortunate that green buses are not really taking off in Singapore after the the two sole hybrid SBS Transit buses were sold off probably due to high maintenance, high operating costs and unreliability. The Fuel Cell technology created by Tsinghua University and NTU is really a very good initiative although it has yet to take off which is probably due to the bus being abandoned. Although I do hope that Green buses like this will someday make a comeback sometime in the future. Chinese manufactured public buses are also not really well-received. Apart from the Sunlong and Higer buses, SBS Transit wanted to try a bus manufactured by another Chinese company, King Long. However, unlike the Higer and Sunlong buses which were used for service at least once, the King Long bus has been plagued with a lot of problems even on the first day it arrived. The state of this bus as of now is currently unknown. 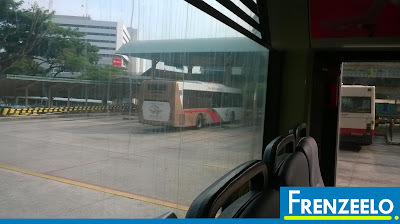 Rival SMRT Buses also trialled some Chinese buses by manufacturers, Yutong and Zhongtong. Both were also shortlived and sold off to other private operators. You can still find them on Scheme B bus services and the Peak Period Short Service bus services. 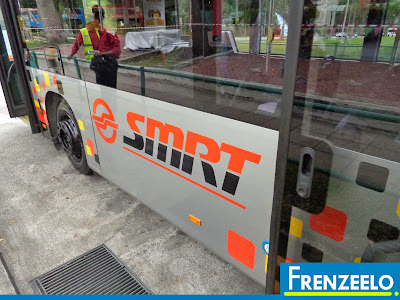 It seems that both operators are now interested in buying European buses with SBS Transit ordering a record number of Mercedes Benz single decker buses and Volvo double decker buses while SMRT orders a huge number of MAN buses. 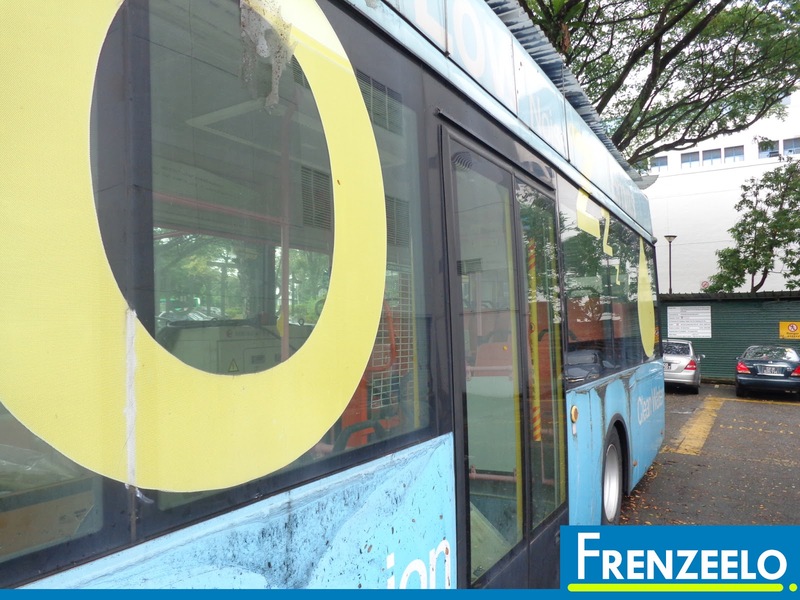 After shortlived trials of environmentally-friendly buses, the possibility of them coming back is currently unknown. SBS Transit is now trying out a new hybrid public bus with Volvo being its manufacturer this time. If this trial is successful, there is a high chance that environmentally-friendly buses can make a comeback. But until then, we can only rely on the current diesel-powered buses which have more powerful but clean engines compared to buses of yesteryears. 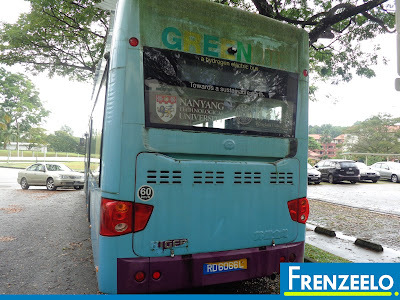 Overall, the abandoned bus is certainly a unique find in NTU. After researching more about the bus, it seems that green buses are not really widely accepted by local public bus operators in Singapore yet as of now. However, as technology and engineering advances, hopefully green buses can be more widespread sometime in the future. 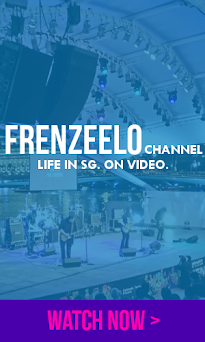 Not only will it save the environment, it will also increase the chances of a car-light Singapore.